Over the past several years, scientists have succeeded in tracking with increasing confidence the portion of climate change that is tied directly to human activity, especially the burning of fossil fuels. Recently published research by Richard Heede of the Climate Accountability Institute documents that nearly two-thirds, 63 percent, of the industrial carbon pollution released into the atmosphere since 1854 can be directly traced to the carbon extracted from the Earth by just 90 entities — 83 producers of coal, oil, and natural gas, and seven cement manufacturers. Almost all of these giant multinational corporations, state-held companies, and fully nationalized companies are still operating today. Topping the list of private and state-held companies are Chevron, ExxonMobil, Saudi Aramco, British Petroleum, Gazprom, Shell and the National Iranian Oil Company. These seven companies alone have produced almost one-fifth (18.7 percent) of all industrial carbon released into the atmosphere since the dawn of the Industrial Revolution. 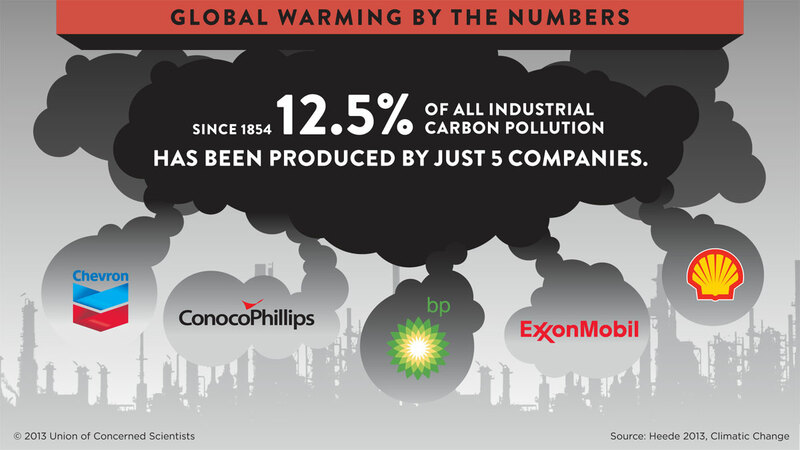 The top five investor-owned companies on the list — Chevron, ExxonMobil, British Petroleum, Shell, and ConocoPhillips — are responsible for one-eighth (12.5%) of all industrial carbon emissions from 1854 to 2010. Nearly half (48%) of all industrial carbon pollution released into the atmosphere from1854 to 2010 can be traced directly to just 20 entities. From Our Blog, The Equation: Who is Responsible for Climate Change? 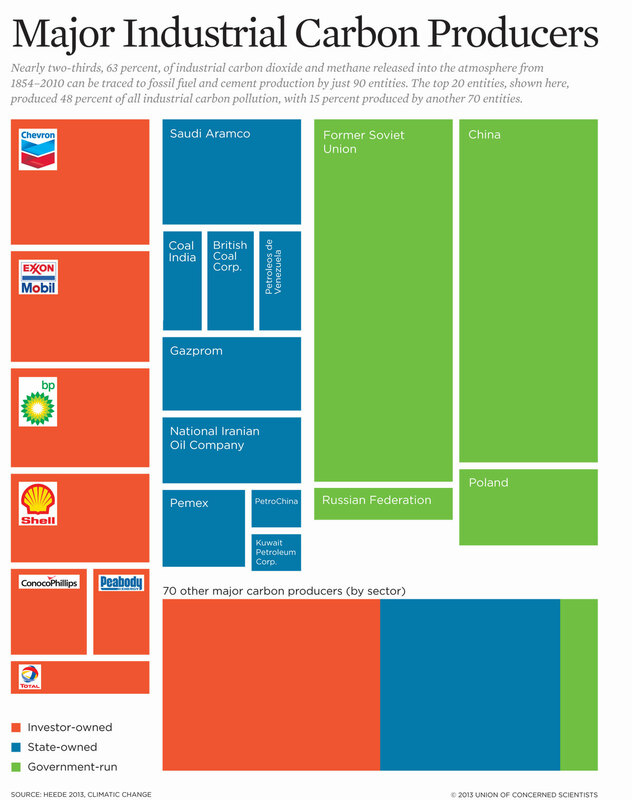 New Study Identifies Top 90 Producers of Industrial Carbon Emissions.